Wolfe’s can take care of all your flooring needs. Many of our customers determine it is time for new flooring. 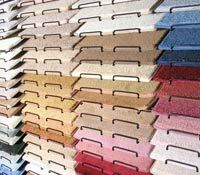 We offer an extensive line of new flooring including: Hardwood, Laminate, Vinyl, Tile, and of course New Carpet Sales and Installation. Please contact us to schedule an appointment to browse the various products or make arrangements to have samples brought to you at your convenience. We are proud of our solid reputation for superior service with integrity that you can trust. We have several options so you can use your preferred method of contact. We look forward to serving you.